On August 21st, 2017 a large portion of the Continental US will experience a total solar eclipse. Much of the rest of the continental US will experience at at least a partial eclipse: Philadelphia will have about 78% totality, NYC 75%, Washington DC 84%, Chicacgo 88%, Los Angeles 70%, Seattle 93%, etc. Street Lights they are a’ changin’. How will telescope light pollution filters adapt? For the hobby of astronomy, the biggest obstacle of all time is light pollution. Hands down. The more lights in yiour area, the less you will see. We try to fight it when we can. Petition for lights that reduce upward glare, maintain some dark sky locations, and advocate for limiting new lighted areas. But on an individual level, there is only so much we can do to fight light pollution. One of those things is to employ a light pollution filter. So you got yourself a new telescope and it is a clear night out. Time to grab the new telescope and bring it outside, right? Hold on there; as many new astronomers have discovered, an observing session isn’t as simple as when you go outside in the winter/early spring to put out the trash. There are several things you should probably prepare before you go out for a night of observing. Far, far too many folks dress for the daytime weather. This can be a problem for you if the daytime was a happy 78 degrees and then drops as the sun goes down into the 60’s. Many an observing session has been ended prematurely because the astronomer forgot to wear a sweater. For colder weather, it is wise to dress in layers. This way you can adjust your level of warmth as the night goes on. The only trouble with dressing in layers is that you need to get dressed indoors where it is warm and putting on multiple layers is a bit more complex than just tossing on a jacket. I have had sessions where I dressed for warmth and then had something delay my exiting the house, the result being me sweating up a storm before I got outside. 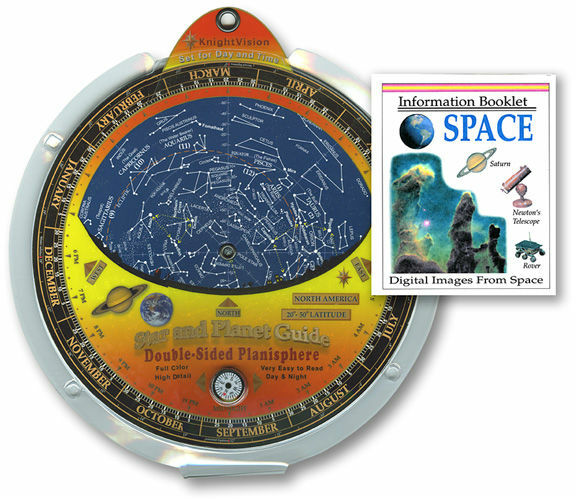 Even if you only have the eyepieces that came with your telescope and a star chart it might not be a bad idea to have somewhere to put these items down. A simply folding aluminum table can help a lot without being too much of a burden. You might also consider some kind of carrying case for the eyepieces. Keeping them in your pocket can be hard on the glass and coatings in the long run. Well before you go out, you should decide what you would like to observe that night, or if you just want to aim the telescope around and see what you can find. The latter can be lots of fun, but it can also get old pretty fast if you don’t find anything of interest. The former does require some planning, so be sure to check your planisphere, planetarium program or other astronomical assistant before going out. Far too many folks turn hobbies into chores – Astronomy is by no means unique in this regard. Doing some work in any hobby to get the most out of it is to be expected, but turning it into a huge burden can make you burn out on astronomy. May is going to be an excellent month for viewing planets – Mars is still quite prominent, Jupiter will show up nicely in the Western sky as the sun sets, Mercury makes one of its rare viewable times on the 25th of this month, and Venus will continue to greet early risers. 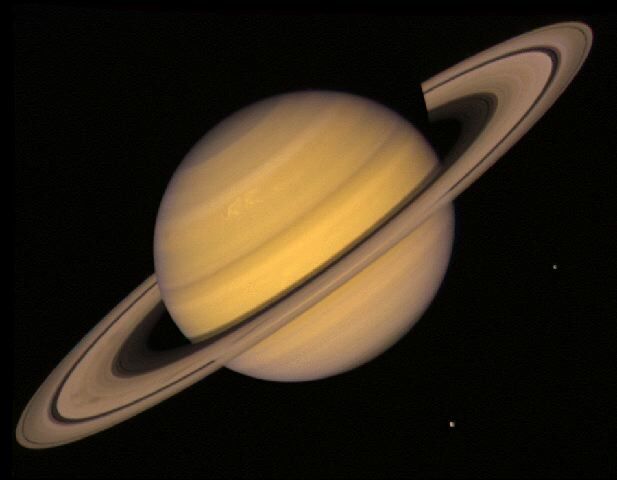 But the big star….err…planet of the month is Saturn. PanSTARRS will make its closest approach to Earth (about 93 million miles) tomorrow – but it really will not be visible despite being at its closest state. Only a couple days later will it creep up over the Western horizon after sunset. On or about March 10th will it start to develop its ‘tail’. In the middle of the Month, the Comet should truly be visible. At time the Moon might interfere. 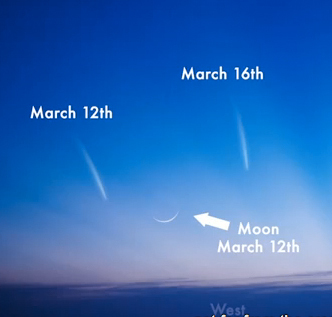 PanSTARRS should be visible in the Western skyline for much of the rest of March. The brightness of PanSTARR is estimated to be about as bright as a star in the Big Dipper. So if you can see the Big Dipper in your night sky, PanSTARR should be visible – albeit more streaky as a comet is want to be. 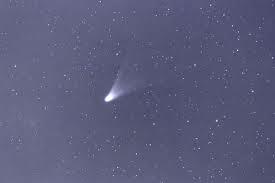 All of this comet discussion comes with a caveat – COMETS ARE VERY HARD TO PREDICT. A wise astronomer once said ” Comets are like cats – they have tails and do exactly as they please”. Many a comet has done something unexpected resulting in disspointing viewing: breaking up, not have the right tail orientation, etc. On the other hand, it could be even brighter than expected (-1 magnitude, not quite as bright as Sirius). But hey, if you are out on a clear March night, it won’t hurt to glance Westward.